As an e-Stewards Enterprise, San Francisco commits to using, wherever possible, recyclers that are annually audited and certified to the e-Stewards Standard. San Francisco’s “e-Stewards Enterprise” status was recognized last week by the Basel Action Network, the Seattle-based nonprofit that created the world’s most rigorous standard for electronics recycling. The e-Stewards Standard for Responsible Recycling and Reuse of Electronic Equipment protects against the dumping of electronic waste in landfills, processing by prisoners, and the export of hazardous e-waste to developing countries. Endorsed by 70 environmental groups worldwide, the e-Stewards Standard ensures worker protection and strict rules for the security of private data stored in electronics. It is the only e-waste standard to include all these protections. 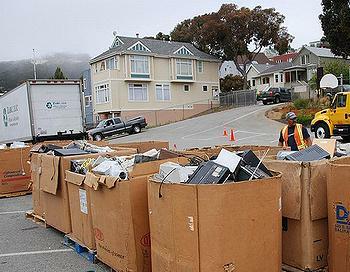 “Leaders lead, and the City and County of San Francisco have demonstrated that the status quo where the majority of electronic waste is routinely dumped in developing countries or our local landfills is just not acceptable anymore,” said Jim Puckett, executive director of the Basel Action Network. “To shrink our toxic footprint and our carbon footprint, to ensure our children’s future, we are going to need more leaders in all public and private institutions to make the kind of bold move that San Francisco just made,” Puckett said. San Francisco is the fourth government entity in the United States to achieve e-Stewards Enterprise status. Also in California, the City of San Jose with its surrounding County of Santa Clara joined the e-Stewards Enterprise program. In Washington state, the City of Seattle, in King County, and the neighboring City of Bellevue also have joined. In December 2011, San Jose became the first government in the nation to earn e-Stewards Enterprise status. In 2010, San Jose recycled 146,000 pounds of city-generated e-waste, and sponsored two e-waste collection events, generating nearly 10,000 pounds of e-waste that were recycled by an e-Stewards Certified Recycler. Other e-Stewards Enterprises include major corporations such as Alcoa, the Bank of America, Bloomberg, Capital One, Nestle, Samsung, and Wells Fargo Bank.